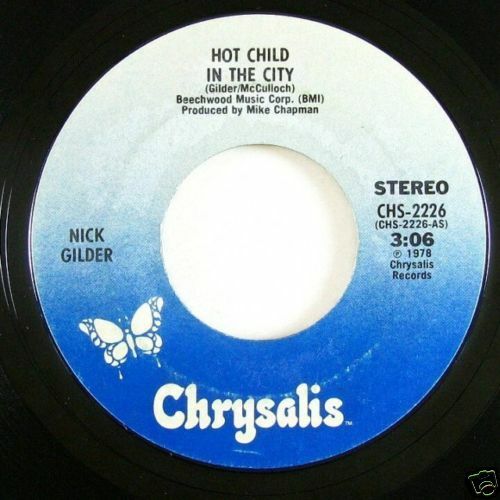 Nick Gilder would only have one top 40 hit but it would be a big one. “Hot Child In The City” would top the American Singles Charts for one week during the summer of 1978. He was a founding member of Canadian rock band, Sweeney Todd, but was replaced as lead vocalist by Bryan Adams during 1978. “Hot Child In The City” was released at the height of the disco era. It was a welcome relief from much of the music at the time as it blended rock and pop in a good way. It had an odd beat that was memorable and made it perfect for radio airplay. Gilder quickly faded from the music scene but left behind this one brilliant single. Adam Ant (born Stuart Goddard) was the leader of the glam/punk rock group Adam And The Ants, which formed during 1976. Ant lost three members of the band to Bow Wow Wow in 1980, but carried on until 1982 when he went solo. He would place three singles on the BILLBOARD MAGAZINE Pop Singles Chart, 1982-1984 before making a comeback in the 1990’s with two more. He also acted in a number of movies and televison episodes. 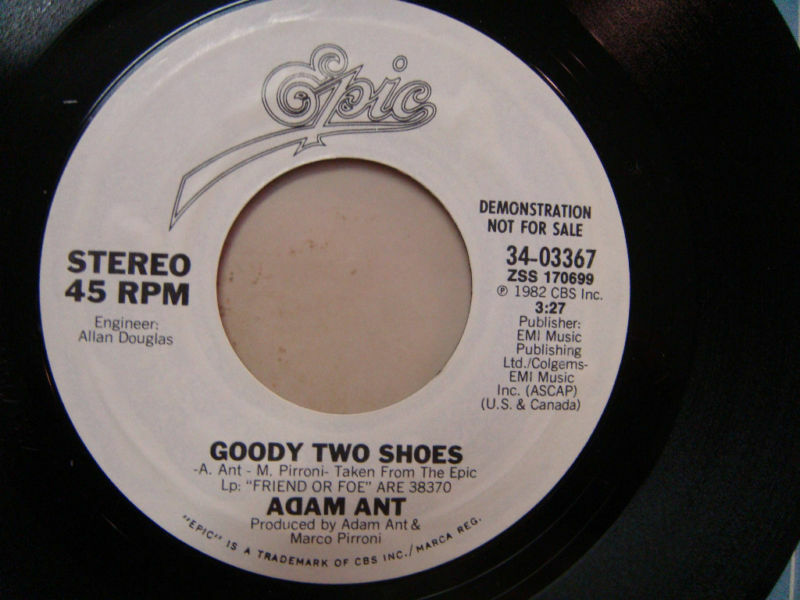 “Goody Two Shoes” was released November 13, 1982 and would become the biggest hit of his career reaching number 12 on the American singles charts. The use of drums with a guitar sound in between was a great way to introduce this strong rocker. I was not a huge Adam Ant fan but this one was a keeper as it had a smoothness that much of his material lacked. A very different Yes returned on August 22, 1980 with their tenth studio album. Rick Wakeman was gone once again but the big news was the absent Jon Anderson, who had quit the band due to creative differences. He would quickly return and this would be their only album to date without his lead vocals. The band’s Fly From Here is due in a few months and it will mark the second Yes release without Anderson’s participation. Drama would mark a change in the band’s sound, mainly due to their new members. Vocalist Trevor Horn and keyboardist Geoff Downes had played together as The Buggles. Their song, “Video Killed The Radio Star,” had been a Number One hit in the U.K. and reached the American Top 40. If I remember correctly, it was the first video ever played on MTV. They were basically a new wave group and their style and approach would influence Yes. They would not be with the band very long, however, so although it was unintended at the time, Drama would be a transitional or connector album. It would become another commercial success reaching Number Two in their native country and 18 in the United States. All five members of the band take writing credits on all of the tracks, although one must wonder if that was for the sake of convenience rather than reality. The first and the last tracks come the closest to their progressive rock past. “Machine Messiah” clocks in at 10:27 and is reminiscent of their past extended tracks. It is a group effort, and the new members mesh well with the old. “Tempus Fugit” is an often-overlooked song in the band’s extensive catalogue. Chris Squire’s bass playing is nevertheless a highlight. The center of the album travels in a different direction. “White Car” was an odd track at just under a minute-and-a-half in length but it has been performed live as a part of a longer piece. “Does It Really Happen” signals the beginning of the harder edged tunes. “Into The Lines” travels in a pop/new wave direction. “Run Through The Light” is a straightforward rocker that looks ahead to the work of Downes and Howe with Asia. Drama is an often overlooked Yes album due to the band’s lineup. Still, it was energetic and polished, remaining highly listenable over three decades after its release. It may be different but it is also very good. Article first published as Music Review: Yes – Drama on Blogcritics. Praise the Lord for tag sales, flea markets, and garage sales. A couple of weeks ago I came across Listen My Friends! The Best of Moby Grape in a dollar bin. My Moby Grape music had been confined to their original vinyl albums, so this was a good and, better yet, cheap purchase. Moby Grape was a part of the sixties west coast psychedelic movement. It featured three guitarists, Jerry Miller, Peter Lewis, and former Jefferson Airplane drummer Skip Spence, plus bassist Bob Mosley and drummer Don Stevenson. All three guitarists were capable of playing lead, plus when they combined together, they would produce one of the more unique and creative sounds of the era. They also had four fine voices that would gel in tight and precise harmonies. Their self-titled debut album was viewed as a classic at the time of its release. It achieved some national success reaching Number 24 on the United States album charts. The problem was the group was over-hyped, which reached a crescendo when their label, Columbia, released five singles at the same time. The only one to chart was “Omaha,” which stalled at Number 88. They continued their success with their second album, Wow/Grape Jam, which reached Number 20, but problems began shortly after. Spence had a breakdown which reduced the band to four members. Shortly thereafter Bob Mosley joined the Marines, then reducing the group to three. The original five members reunited for an album during 1971, but the band was basically finished. They have reunited off and on over the years, with and without Skip Spence. The four original members of Moby Grape, with Omar Spence substituting for his father, have been performing together since 2007. Listen My Friends! The Best Of Moby Grape is a nice retrospective of their career. The twenty tracks represent most of what can be considered their best. Tracks such as “Hey Grandma,” “8:05,” “Motorcycle Irene,” “Going Nowhere,” and “Omaha” among others are all nice relics of the psychedelic era. Their ability to fuse blues and folk into a psychedelic mix enabled them to produce some of the best music of the late 1960’s. The packaging is first-rate with some rare pictures and a couple of interesting essays included. Columbia has also done a good job of cleaning up the sound. Today Moby Grape has been regulated to the second tier of 1960’s west coast bands along with the likes of the Electric Flag and Country Joe & the Fish, which is good company indeed. Listen My Friends! The Best Of Moby Grape is a fine document of some of the best and underrated music of the psychedelic movement. Article first published as Music Review: Moby Grape – Listen My Friends! The Best of Moby Grape on Blogcritics. Yes returned with Tormato, its ninth studio album, on September 20, 1978. It was less ambitious than many of its prior releases, as there were no long and extended tracks. The songs ranged in length from 2:25 to 7:47 minutes. Tormato was welcomed at the time, as it was an easier listening experience and continued the band’s commercial success on both sides of the Atlantic, reaching as high as number 8 in the U.K. and number 10 in The United States album charts. It was also true to Yes’ progressive rock roots but was more melodic overall, and the songs were more polished. The original vinyl release suffered from poor production, especially with Chris Squire’s bass. I have heard a CD reissue of the album and the mix seems much better. This would be the lineup at the time’s last album together. Squire, drummer Alan White, and guitarist Steve Howe would continue but keyboardist Rick Wakeman and original member Jon Anderson would both be gone before their next album release, and would not return for years. Tormato was not Rick Wakeman’s finest effort but I have always liked his harpsichord work on “Madrigal.” My only complaint is the track is too short to really settle into and enjoy. Another fine group effort was “Circus Of Heaven.” The melody is pleasing to the ear, as the lyrics explore the realm of fantasy. “Release, Release” is energetic and competent rock, as it settles into a good groove. The final two tracks travel in different directions. “Onward” is classic Yes, as it makes use of an orchestra. “On The Silent Wings Of Freedom” is the longest track at just less than eight minutes. It is a somewhat somber affair but sort of lulls you and was a nice way to conclude the album. As I have been traveling through the Yes catalog, the constant pleasure has been the guitar virtuosity of Steve Howe. Whether electric, acoustic, or somewhere in between, very few musicians can claim the consistent excellence of his body of work. Looking back on Tormato, it was a little change of direction for the group. I remember playing the album quite a bit when it was released. Now, when I turn to Yes for some music, I tend to prefer their albums that contain longer, extended tracks. It remains an OK listen, but not a starting point in exploring the Yes catalog of music. Article first published as Music Review: Yes – Tomato on Blogcritics. 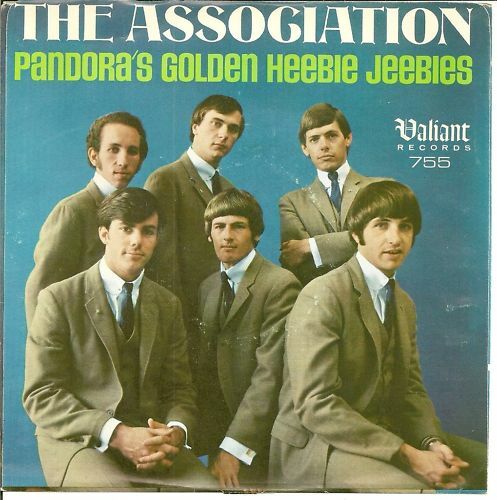 The Association had just topped The American singles chart during the fall of 1966 with one of the memorable ballads of all time. “Cherish,” which spent three weeks in the number one position. Another clunker would follow as their Valiant label went out of existence. But not to worry as better time and more hits lay ahead. Van Dyke Parks has had a long and varied career but he is best remembered for his association with Brian Wilson and the aborted, at the time, Smile project. He would assist in finishing the project nearly forty years later. As a child he had a recurring role as the kid upstairs in Jackie Gleason’s THE HONEYMOONERS. He would be a member of the folk group, The Greenwood Country Singers. He would go on to work with the like of The Beach Boys, The Byrds, Ry Cooder, Grace Kelly, and, Ringo Starr among others. He released his first solo album, SONG CYCLE. during 1968 and seven more would follow down through the years. 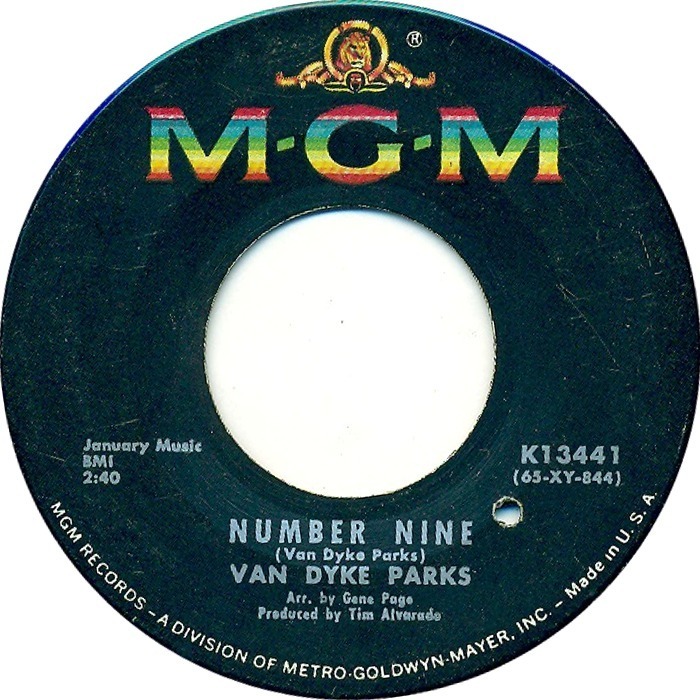 “Number Nine” was typical of his single releases. They never achieved any commercial success but they were always interesting. You are currently browsing the Muskmellon's Blog blog archives for April, 2011.